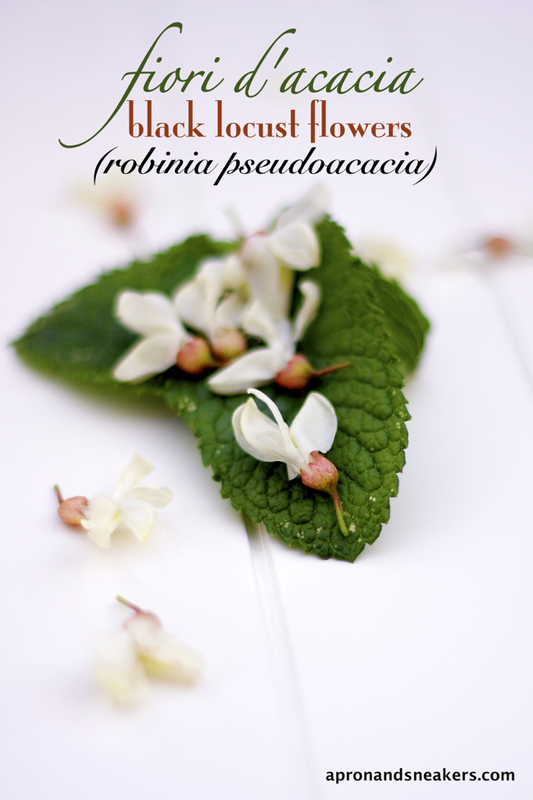 Before heading out harvesting some of these beautiful clusters of flowers with jasmine-like scent, you need to know that only the flowers (and the little stems connecting the florets) are edible. The rest are toxic, including the leaves. Their blooming period is very short, between 10 -15 days at the beginning of spring. The best time to get the flowers is at the beginning of the blooming, when the flowers are still closed or just opened. When you catch them at the end of their prime, they should have already lost their fragrance and flavor, but still edible nonetheless. Our garden is lined with these trees that come out like weeds. We actually consider them weeds because they grow fast and everywhere. They have big thorns, so watch out. My husband was just diligent enough in pulling out the ones that are growing in odd places and maintained the ones that grew naturally in good spots. A lot of Italian roads are lined with these trees so they can be found everywhere. The Italian region that cooks these flowers more is Veneto. Then there's also Tuscany. They are made into liqueurs, used as ingredients in cakes, fritters, and pancakes like how I cooked them last year. I was going to name these fritelle, but for translation problems last year, I named my black locust pancakes, fritelle too because that was the translation I got during that time. 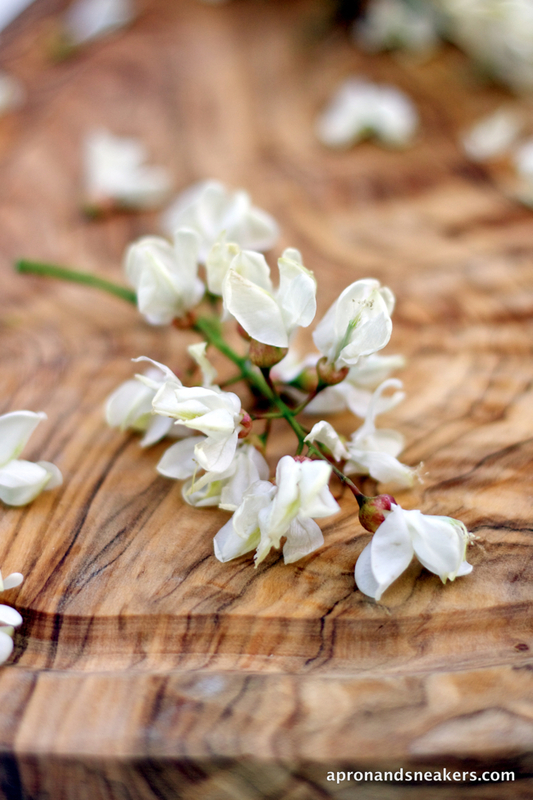 These fried black locust flowers can be called in two ways in Italian. 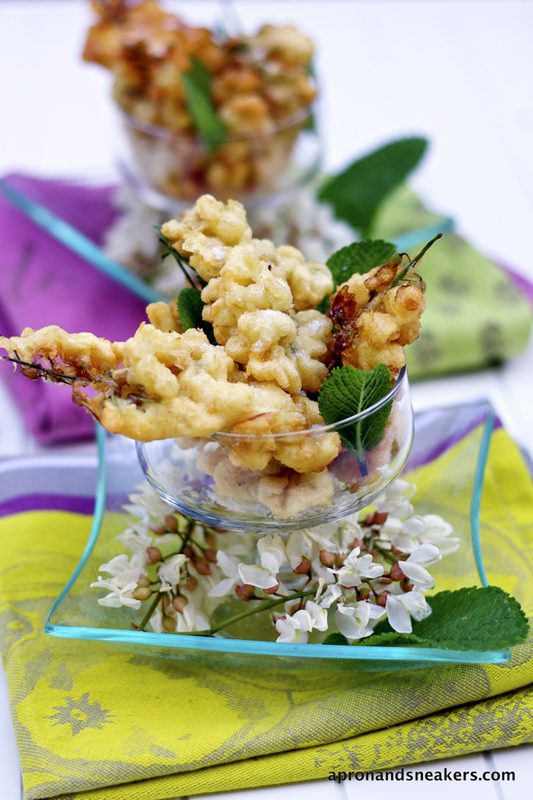 Fritelle di fiori d'acacia (Black locust flower fritters) or Fiori d'Acacia Fritti (Fried black locust flowers). Ok, that cleared, let's fly to Gradara. 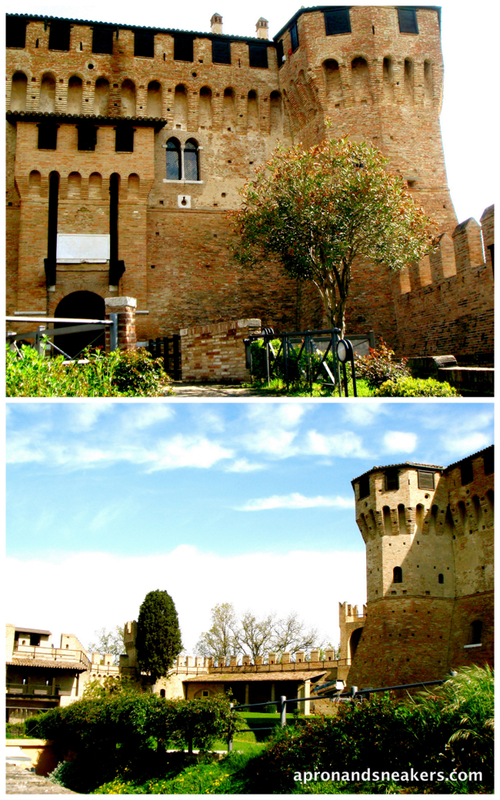 Beautiful medieval Gradara. It's a town in the Marche region of Italy, on the opposite side of Tuscany. 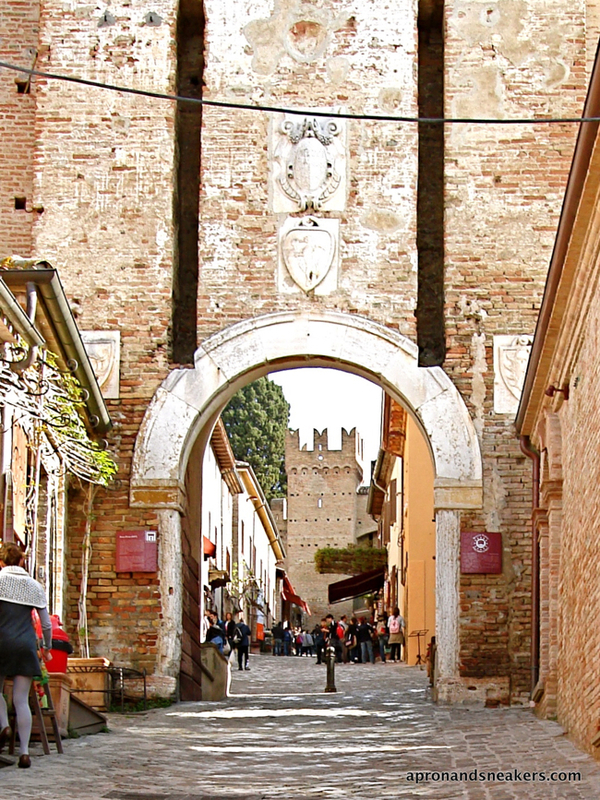 Marche is less traveled by tourists but equally beautiful and more serene. In fact, this is one of my top three regions. Town after town, there's always something beautiful to see. The people are relaxed and friendly. And the food, like in all regions of Italy, is superb. 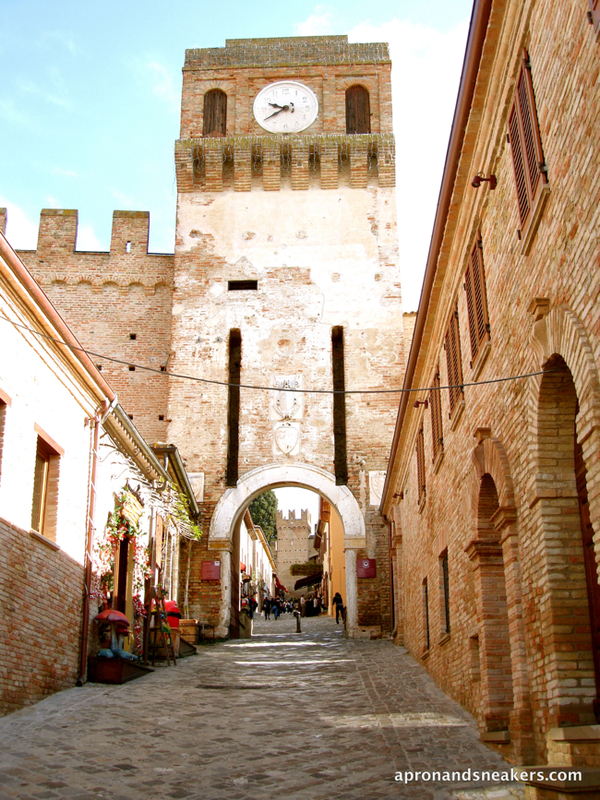 These are pictures from our trips to Marche the previous years. For two consecutive years, we went around the area extensively. On the photo front, I did not take so many pictures of the places we saw because I focused more on every single movement our son did during our travels when he was still a toddler. But I'm sharing with you the photos I took of the medieval towns we visited in the next posts. Gradara is the cradle of the tragic kiss between Paolo and Francesca told by Dante in the 5th canto of “Hell” in his Divine Comedy. This forbidden kiss has inspired so many artists and poets in different periods. The castle was originally built as a tower in the middle of the 12th century. It had received a number of constructions and additions of other wings over the centuries that followed until the 18th century. 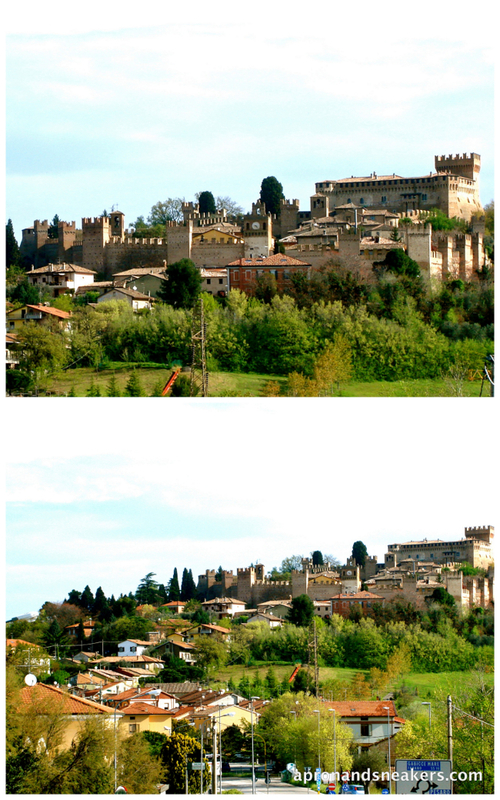 You can see more of this place at the site of I Borghi Piu' Belli d'Italia (The most beautiful villages of Italy). I usually refer to this site for ideas on places to visit. I hope you all had a good weekend. Thank you for reading! Clean flowers well to get rid of insects. Take away the leaves. They're not edible. Soak them in water for about 10 minutes. Drain & pat dry with kitchen paper towels. In a bowl, whisk the egg yolks, milk, salt, vanilla and sifted flour. Whisk until the batter becomes smooth and dense. Cover and let it rest for half an hour. In another bowl, whiskthe egg whites and 20 g. sugar until stiff. Add egg white mixture to the egg yolk mixture using a wooden spoon or rubber spatula. 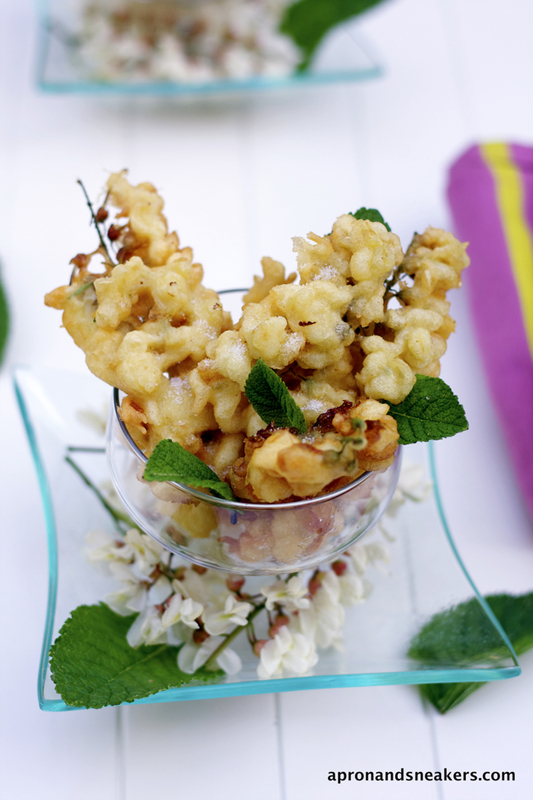 Prepare a saucepan with abundant oil for deep frying. When the oil is hot, (ideal temperature is between 170 - 180 degrees Celsius), dip flowers in the batter one by one and drop them in the oil. One way to check if the oil is hot enough is to dip a wooden skewer in the middle of the oil. If tiny bubbles come out along the stick, then it's ready. Don't overcrowd them in the saucepan and make sure they don't stick to each other. Brown both sides. Transfer them to a plate covered with kitchen paper towels to absorb excess oil. Sprinkle with sugar. Serve hot.